In 1936, Erick P. Swenson of Spur Ranch donated land to the City of Spur for the purpose of a park. As the county was experiencing devastating loss due to the Depression and the drought, the City and the Works Progress Administration (WPA) partnered to establish a place for social interaction and recreation for the children of the surrounding rural communities. Many of the workers were from rural agricultural areas and were trained on site. The bathhouse was constructed with local stone and petrified wood in 1937. The pool was the only recreational area for miles and provided a welcome reprieve from the heat and hard labor that was customary to the ranch farm families during the summer. The swimming pool complex was closed in June 2009 when workers were preparing for the summer opening. The bathhouse is in fair condition and the roof was repaired in 2008 after a storm. However, the concrete pool is in danger of complete collapse due to leaks and erosion. The cost of replacing the leaking pipes and backfilling the void beneath the pool is the same as the cost of replacing the pool. 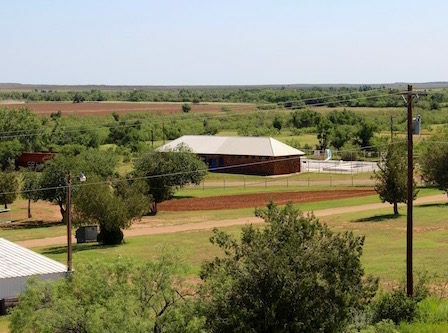 In an isolated rural town, the pool and bathhouse continue to serve as one of the only recreational and social venues for the youth of Spur and surrounding communities. It is the hope of local preservationists that the swimming pool and bathhouse are rehabilitated and the complex is re-opened for public use.